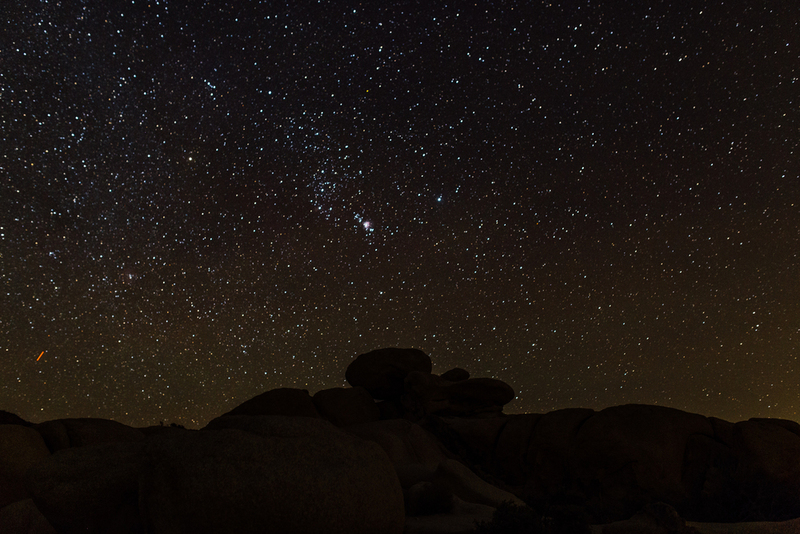 Joshua Tree National Park - " I've never seen stars like this "
A few hours down interstate 99 and we found ourselves in Bakersfield and surrounded by low lying foliage and desert mountains of rich purples and tans. Nightfall reached us shortly after making our way into Twentynine pines, the nearest town to Joshua Tree, at this point the roadways stretched flat and straight for forty miles on end, this is were we found out that our reliable and trusty van was limited to a less then satisfying ninety five miles per hour. The light pollution was just about at zero due to being so far out and the cold air killing an atmospheric haze. as we zipped down the open roadways with the windows down and a late night nineties boyband playlist singalong happening the night was one ill never forget, Me and a good friend with nothing but a horizon of stars in a new land. Upon reaching the entrance of Joshua Tree National Park we read a sign saying to quietly find a place to sleep and camp and not to worry about paying the camp fees until the morning. This put a slight smile on my face, knowing that there are still places in this world that gain trust onto fellow peers and trust an adult will act as such, now i don't know if this is a sad reflection on myself or this worlds current status but thats neither here nor there. Through the help of the always trusty trip advisor app we found a nice camping area outside of the famous arch in the park and nestled our camper in-between rock formations and began setting up our van for sleeping and our photography gear for capturing the brilliant display the sky was putting on for us. The night brought upon us howling winds and frigid temperatures, although warmer then the previous night in Yosemite the winds were far worse. We propped our selves and gear up high on the close rocks, weighted down our tripods, and sat bundled up as the long exposures jammed. We stayed out for a few hours before the bitter cold made us pack up and retreat back to the van, the time i was out on those rocks sitting just me, my camera, and the surrounding stars was a real form of magic, i felt my soul cleanse, the mess thats usually in my head cleaned, it was the truest form of peace and happiness. The night spent in the van again brought shiver but was bearable. Again we had found ourselves pleasantly awoken moments before the sun was about to rise. We pulled back to curtains to reveal the glorious scene beyond the windows, tones of violet and teal painting across the rocks and sky, stepping out of the van was like stepping onto a martian terrain. We packed up our gear and headed into the vast desert to begin capturing the beauty that surrounded us. We climbed on top of the massive stones, down through dusty trails avoiding cacti. Quickly we grew hungry and thought it best to go find some food before the mid day sun, we headed into the nearest town and grabbed a delicious skillet of vegetables and eggs. As delicious as breakfast was and as needed as the coffee we raced through it fueled for more adventure. On the way back through the winding roads into the park we made a quick pit stop at the local donut shop. Once back inside the boundaries of the park we headed further south until the road went from pavement to sand, we pulled off and followed a rocky trail to what was a mining town.All that was left of the town was some old stone foundations and a couple closed off shafts. We perched on a cliffs edge and took in the view while picturing the old town bustling with pick ax laden workers. Continuing down the road we made our way to the location of Skull Rock, a formation thats as old as the park itself, massive stones reach to the sky with the unique weathering on them transforming them to form a skull overlooking the vast desert. We climbed and took in the last of our time in the amazing park before foraging onward to The Sultan Sea. Joshua Tree was a unique landscape and brought our eyes and cameras spectacular sights. There was absolute magic in that desert, the kind that makes you happy to be where you are with whom you are with. The Salton Sea - " Why is there a pile of dead birds? " Yosemite National Park - "The heat doesn't work"